The LEGO catalog helps children learn and grow during every stage of development, unleashing creativity in babies, kids, teens and adults of all ages. Your savings will be applied automatically at checkout on the LEGO website. Products - It doesn't matter how old you are, you'll always remember when you played with your first set of LEGOs. Open the door to your child's imagination with a world of wonderment that comes with every LEGO toy, figurine, set or LEGO game. From the world-famous LEGO brick that started it all, to state of the art video games, you'll find dozens of products and themes that will delight youngsters as well as the young at heart. Whether they build houses or boats, spaceships or cities, the sky is the limit with toys that provide endless hours of entertainment while creating new experiences and masterpieces that will fill them with pride. Games - The name 'LEGO' is an abbreviation of the two Danish words "leg godt", which translates to the phrase "play well". Since 1932, LEGOs have been helping children play well with an exceptional collection of toys that have expanded from basic building blocks to hi-tech video games, brain teasing board games to free web based LEGO games and an entire Universe of amazing online adventures that can be enjoyed and accessed from your own computer. Order the LEGO catalog and join the LEGO community, encouraging your child to play, create and share with the worldwide family of LEGO lovers found all around the globe. 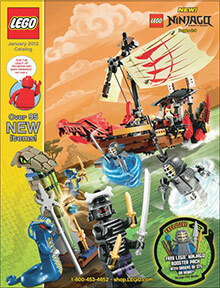 Shop - LEGO features thousands of classic toys as well as hot new games for kids, teens and adults of all ages. You'll find exactly what you want in LEGOs online toy shop, enjoying a streamlined shopping experience with every order you place. Shop by LEGO toy theme, by age, by category, or shop the LEGO catalog online by simply inserting the catalog item number and/or your catalog source code. Whether you're shopping for a Birthday, Christmas, classroom or just because, ordering LEGO toys and products couldn't be any easier. For almost 80 years, the LEGO catalog has thrived, from humble beginnings in a tiny carpenter's workshop in Denmark, into a modern, global enterprise that is the world's fourth largest manufacturer of toys, reaching children in over 130 countries. Invest in the best toys for children of every age, every skill level and every background, because no matter where you live or how old you are, every child speaks the universal language of LEGO.